Sheesh, it’s been a long time since I last posted – I’ve had so much going on in my ‘real’ life that I’m ashamed to say that poor old pip & little blue has suffered a bit. Alas, these things happen, so I am intent on not feeling too guilty about it. It’s the intention that counts and, although I will never manage to reach the giddy heights of posting quality content every day (I am in awe of those of you who manage this), I truly do my best and am sure many of you can empathise with life getting in the way! Today’s treat is a wondrous gluten-free fig frangipane cake – a beautifully moist and golden almond sponge dotted with sweet, caramelised figs. Basically a cake version of the classic frangipane tart filling, it is the perfect vessel for any seasonal fruit glut you might be lucky enough to be enjoying. My boyfriend and I bought far too many figs at Borough Market last weekend. It was sort of by accident – we were on our way home, the market was wrapping up and prices were being slashed…neither of us can resist a bargain so we ended up with two punnets of figs, two punnets of kiwiberries (if you haven’t tried them you must – they are the best thing since, well, kiwis) and a punnet of strawberries. That’s a lot of highly perishable soft fruit for two people! Preheat your oven to 180°C and lightly grease a 20cm loose-bottomed tin and line the base with baking paper. Cream the butter and sugar together (I use the beater attachment of my food mixer but you could use a wooden spoon). Gradually beat in the eggs, vanilla essence and almond milk (scraping down the sides of the bowl to ensure nothing escapes) until everything is incorporated. Fold in the almonds, flour and baking powder until the mixture is smooth. Spoon the frangipane into your prepared tin, gently level the surface, and arrange the figs on top, pushing them down into the mixture until nicely tucked in. Bake for 50-55 minutes until golden brown on top and firm in the middle, and a skewer comes out clean. Leave to cool in the tin for about 10 minutes and then transfer to a wire rack. Very delicious served warm but will keep in an airtight container for a few days also. 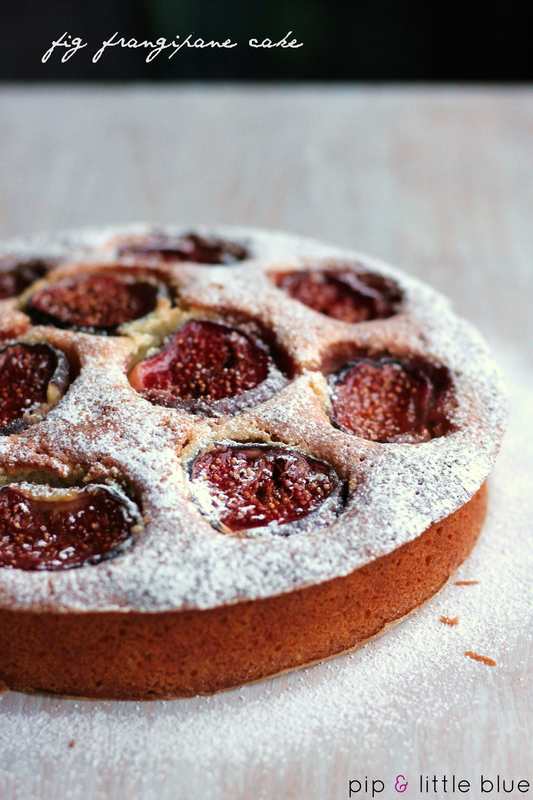 Tags: autumn, Baking, cake, dessert, fig, frangipane, gluten-free, recipe, seasonal, teatime, vegetarian. Bookmark the permalink.